My OMG (One Monthly Goal) for November was to piece my Squared Away Sampler blocks into a flimsy (quilt top). I am happy to report that I met that goal! You can read about it in this blog post by clicking here. I am still on the fence about whether to add another border or not. Most of the time, I think not, but then again…. I know I’ve been absent from blogging, but work is really busy and demanding this time of year. There is little time for much else. So if you would like to see more eye candy then go visit Elm Street Quilts OMG (One Monthly Goal). I will be linking up there! There are no new colors/blocks being announced for November and December. Instead, we are given the time to move our projects forward, or complete them. I chose to make my RSC18 blocks for the Squared Away Sampler this year. I have sewn my blocks into an on point setting with star sashing. *If you click on the photo, then you can see a closer view. I don’t know it you can tell, but the setting triangles are white polka dots, not checks. I am still considering a border, but I don’t really think that I need to add one. If you would like to make the Squared Away Sampler, you can visit The Academic Quilter for great tutorials on making all of the blocks. I am linking up with So Scrappy. Click on the link to discover more scrappiness! 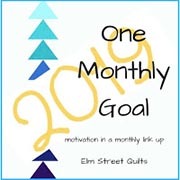 Before I state my quilting goal for this month, I would like to take the time to thank Patty, of Elm Street Quilts, for hosting One Monthly Goal. She has kept me accountable and thus motivated me, to work on projects and achieve accomplishments all year long. She is uncluttering my mind (and making room for other projects), stitch by stitch, project by project. I am planning on devoting free time (It is holiday season after all…how much free time can there be when one works for the post office?) to turn my RSC18 Squared Away Sampler blocks into a flimsy. I added one more block, a brown one, and am working on the sashing and cornerstones. I can’t leave them here since I have a sweet chubby calico baby who finds it fun to roll around on them. Hubby remembered that we bought a backdrop set up used for photography, and then promptly forgot that we had it. Good grief! Click here to see what I am talking about…there are other systems but you get the idea. It is nice when one doesn’t have any wall space. So off to the fabric store to buy some flannel, and I will soon have a proper design wall to use. I am linking up with Elm Street Quilts OMG (One Monthly Goal). Click on the link and go see the other participants and get motivated to work on your projects! It is time to report on those October sewing goals! I completed my three blocks for the RSC18 Squared Away Sampler, and you can find that post by clicking here. I am really happy that I completed the applique on the Butterfly Garden quilt this month! I did not think that I would get this done, but now I have a completed flimsy! The bow tie leader/enders are multiplying too! I am linking up with Elm Street Quilts OMG (One Monthly Goal). Click on the link and see the other participants accomplishments and get motivated to work on your projects! Dark green and sage are the colors for the month of October announced by So Scrappy and The Academic Quilter. I made three Dewey Dream blocks in the 5″ size for the Squared Away Sampler. I reversed the green and neutral in one of the blocks just to have a visual of how the block would look when moving value around. Now that I see it, my personal preference is having a dark value for what I am calling the background. For some reason, the camera didn’t pick up the green color very well; it isn’t that dark! If I decide to set these blocks on point, I shall be making one more block, perhaps a brown one. I am holding off on my decision (although I do have something in mind) until I see what The Academic Quilter suggests for settings. I will be linking up with So Scrappy. Check out the link and see what others are doing with dark green and sage this month! Dark green and sage are the RSC18 colors for September, and I will be piecing three 5 inch blocks for the Squared Away Sampler project. You can see my progress so far this year by clicking here. Remember the Butterfly quilt project? I posted about it here. The applique is fused, but not stitched. For my second goal, I hope to complete the applique by stitching all of the pieces down. I plan on using a satin stitch around the edges. If you would like to make this free pattern, then click here. I won’t have a lot of time to complete sewing goals this month, since I plan on a week of R & R, and the rest of the month belongs to the day job. We’ll see how much I can accomplish. I am linking up with Elm Street Quilts OMG (One Monthly Goal). Check out the other participants and get motivated to work on your projects! It is time to report on those September sewing goals! I am so happy to report that I have finished my President’s Book fabric pages! In fact, I have completed a tome, not just a book! This thing is big! I am going to have to come up with a plan to display it in my sewing space. This book is very special to me, since life took a turn and I have not been able to spend time with these precious quilting friends. Some have moved on, and some have passed on as well. But I have wonderful memories each time I look at these pages. You can read more about this project by clicking here and here. You can see pages in slideshows by clicking here and here. Another goal was scrap control. I did cut my scraps into usable strip sizes. The strips are sorted by color and size and stored in plastic bags in bins. I am linking up with Elm Street Quilts OMG (One Monthly Goal). Check out the updates of the other participants and get inspired and motivated! It has certainly helped me to announce goals to the world…I am actually completing a few!